The President of the Association for Death Education and Counseling (ADEC), Illene Cupit, found time to speak with Open to Hope’s Dr. Gloria Horsley during ADEC’s 2015 conference. Cupit is also at the University of Wisconsin, Green Bay, which she uses to bolster a grief camp for kids. “I started a grief camp at my university ten years ago” because kids who suffer a loss often need “permission” to be a child again, says Cupit. She loved camps herself as a child, and found the perfect opportunity to marry two of her passions. As a professor, Cupit works with college students and adores her academic work. However, she also saw the campus as a fantastic platform for hosting camps and getting back to her own love of the summer camp experience. “Bringing kids together who have all had this loss experience” shows them that they’re not alone. Plus, providing fun experiences from swimming to relay races shows children in grief that it’s okay to have fun again. Cupit’s one-week camp is currently a day camp hosted at the Green Bay campus. However, university housing is available for parents, and some children stay with grandparents who live around the Green Bay area. Taking place the last week in June, Cupit’s college students train the entire spring semester to work with the kids, and every college mentor has no more than two “camp buddies,” ensuring there’s no lack of resources. Camp Lloyd welcomes children from around the world and features a unique experience that every child in grief deserves to experience. A supportive community, one week of sheer fun and friendships made for life are just a few of the promises Camp Lloyd makes. It’s not too late to enroll, or to find out more information for next year’s camp session. 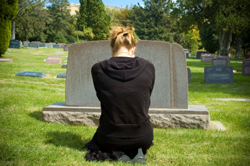 Dr. Gloria Horsley is an internationally known grief expert, psychotherapist, and bereaved parent. She started "Open to Hope" to help the millions in the world with grief. She is a licensed Marriage and Family Therapist and Clinical Nurse Specialist, and has worked in the field of family therapy for over 20 years. Dr. Horsley hosts the syndicated internet radio show, The Grief Blog which is one of the top ranked shows on Health Voice America. She serves the Compassionate Friends in a number of roles including as a Board of Directors, chapter leader, workshop facilitator, and frequently serves as media spokesperson. Dr. Horsley is often called on to present seminars throughout the country. She has made appearances on numerous television and radio programs including "The Today Show," "Montel Williams," and "Sallie Jessie Raphael." In addition, she has authored a number of articles and written several books including Teen Grief Relief with Dr. Heidi Horlsey, and The In-Law Survival Guide.